On a five degree grid has been calculated the number of SKS waves that could be potentially recorded by using the real seismicity for the year 2004. 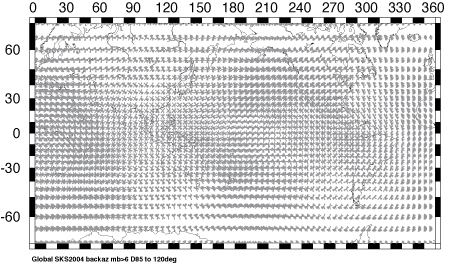 Events are selected with magnitude larger than 6.0, occurring at distances between 85 and 120 degrees. The pattern observed for the year 2004 indicate that north America is clearly the best place to perform SKS wave splitting studies, with more than 100 events recordable by year. Africa is also well located from the global seismicity to use SKS waves. The SW pacific and the South Atlantic and South America are bad places to perform SKS splitting with potentially less than 30 events by years. The potential backazimuthal coverage of the SKS waves is calculated at each five degree grid at the Earth’s surface. Each segment on this map represents the backazimuth of an incoming SKS wave of magnitude larger than 6.0 and occurring at epicentral distance between 85 and 120 degrees. 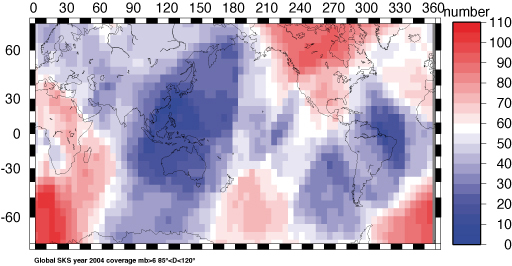 North America and Africa are characterized by good coverages whereas the Pacific, South-East Asia and South America have rather poor backazimuthal coverages. Below are provided the postscript (ps) files of the SKS global coverage for the years 2002, 2003 and 2004.